Now that "baby killer" is the new "you lie! ", close observers of Congress could be forgiven for thinking that watching CSPAN coverage of the healthcare reform debate could actually diminish understanding of important public issues. Washington has gone toxic. And too many in Congress can't discuss abortion in any but absolute terms. There was no policy discussion during the health care reform debate from a medical - as opposed to political - perspective on why abortion services should or should not be covered in health insurance plans. In what ways do unintended pregnancies affect women's health and what are the consequences of denying health insurance coverage? What can go wrong with planned pregnancies that lead to terminations? Instead, the policy debate began with ensuring that no federal funds would cover abortion services. Anti-choice politicians used this starting point as an opportunity to gain ground by reshaping the private insurance market to drop abortion coverage. The debate became about how burdensome and stigmatizing the new law would make insurance coverage for abortion, even for policy-holders receiving no federal subsidies. Sen. Ben Nelson (D-Neb.) succeeded in imposing unprecedented restrictions on abortion coverage, and Rep. Bart Stupak (D-Mich.) persuaded the President to give these new restrictions a special shout-out in the form of an executive order. After months of rancor and front-page headlines, it feels inevitable that government funding for abortion services is a non-starter. But it doesn't have to be that way. While our parochial discourse has stagnated, countries around the world have recognized what the right to abortion means for the women's ability to control their health and life. Courts and governments have also increasingly tackled the problem of how to transform a theoretical right to an abortion into real access to services for women when they are needed. 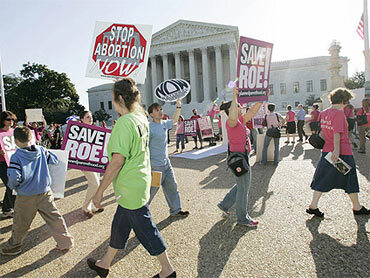 The Center for Reproductive Rights recently took a look at the last ten years in reproductive rights. We found that, internationally, the past decade has been a time of real hope and progress for reproductive health and rights. Countries like Ethiopia and Columbia have abandoned their abortion bans, recognizing that such prohibitions deny women fundamental human rights. Drawing on the work of International Human Rights bodies, the Constitutional Court of Columbia eloquently explained that "sexual and reproductive rights emerge from the recognition that equality in general, gender equality in particular, and the emancipation of women and girls are essential to society," and that "[p]rotecting sexual and reproductive rights is a direct path to promoting the dignity of all human beings, and a step forward in humanity's advancement towards social justice." When was the last time you heard anyone in Congress talk that way? Some countries around the world are not merely catching up with the U.S. by recognizing that women have a fundamental right to abortion, they are moving beyond our limited vision that segregated rights protection and funding. From Columbia to Nepal, countries are recognizing that the granting a legal rights to abortion is only meaningful when financial barriers to abortion are eliminated. Congress and the President sadly failed to draw that same connection during health care reform. Twenty-one of the twenty-seven members of the European Union - and another five European nations and Israel - provide funding for abortions through public health insurance or in public health facilities. In Canada, all provinces provide abortion coverage at hospitals and many also cover costs at private clinics. A real success story of the last decade is Nepal. Before 2002, abortion was illegal in Nepal and women and their children often served time in prison based on the allegations of neighbors or estranged family members. It was finally legalized in 2002, yet prohibitive costs continued to create real obstacles to women's ability to obtain abortion services. So Nepalese women, with our help, went to court. In 2009, Nepal's Supreme Court ordered the government to create a fund to ensure that women have real access to abortion. The fund has to include enough resources to both meet the demand for abortion services from rural and poor women. In addition, the government must educate the public and health care providers about Nepal's abortion law. The Court took concrete steps to address the disparity that existed between a legal right and the ability of all women - not just the privileged - to exercise that right. In seven short years, Nepal went from locking up women for violating a criminal abortion ban to providing public funding of abortion services. It's 2010, and countries like Nepal are putting the United States to shame. If Nepal can recognize that rights on paper must be backed up by public funding, why are so many of our lawmakers afraid even to talk about abortion access? It's time to take a step back, a look around, and a deep breath - and to start really talking about the importance of access to abortion to women's health and equality. Let's catch up with this global conversation, so that we can join this growing understanding of the importance of these rights - both on paper and in practice - for the lives and dignity of women and families.